So, we know we need to replace the liner. Just got a quote and hoping someone can help me know if it is decent. I attached the quote. But it is $4,195.00 for liner replacement. We are in Massachusetts, do will a20 mil liner be sufficient? That seems high, unless they are custom measuring it to make one. and it could not be found on the old liner. Yeah, get another price. I seldom comment on pricing but that is too high. Thanks - your input is greatly appreciated!!! Didn't know they actually saved water to reuse. I guess they pump it into water trucks. Is that cheaper than discharging and rebalencing? This company actually pumps it into these military grade bladders. It saves a ton of money and water. Water is not cheap here since we are still in drought. $4,900 plus water replacement as they just drain it and if we want 27 mil, it is an extra 15%. They say things in Massachusetts are more expensive than other states, maybe it's true for this as well. To open the pool last year- literally just taking off cover, dropping in the chemicals I bought, taking it the plugs, putting in ladder (no testing of water, and it was green) they charged$425!! I'm close to NY so very similar prices to the Boston area. That is what I've heard in my neck of the woods too for a new liner (similar to your first quote). It's easy to get a third quote though since you have the specs. I like that they reuse the water, had not heard of that. Let us know what liner you choose. It's exciting since most people will only change their liner a few times during the life of the pool. The pool opening sounds high. In NJ they are no more than $200. We are having our 18' x 36' liner replaced in the upcoming weeks. I have estimates that range from $3200 - $3500. Narrowed it down to a very highly recommend smaller local pool co. who has done many liners in our area for about 25 years . Have seen many install photos from them and offered referrals if we wanted (we already had some from friends) . Was able to see their own actual real pictures of many liner installs , and many in our desired liner choices, so we know they do a LOT of liners . They all look great, and the company is known for being perfectionists ! They happen to be the higher $3500. estimate . The pool Comp is supposed to be here today to drain pool down to get accurate custom measurements tomorrow (they are perfectionists , and will not just guess on those measurements). All of their liner jobs fit perfect, so I feel very confident with their process . Their $3500. estimate / price including everything except about 2 truckloads of water (the rest I can fill with our hose well water ) . That includes all labor for removal of old liner and disposal , preparing/patching smoothing out the old surface / bottom of pool , fixing any irregularities in the side walls (luckily we have fiberglass sides, so there wont be any rust issues) , deleting the old underwater pool light niche area , and full install of a new 28mil liner (they use McEwen industries liners) , including return faceplates and such . Only other cost will be approx 2 truckloads of water so they have enough to fit the pool liner into place properly while using the vacuum/blower technique as well . Also, we pay the water truck co. of our own choosing , the pool co. does not make extra $$$ on the water fill . We should be roughly $4000 - $4200 by the time its installed including a bulk of the water . This will be with a 28 mil liner, but also including whatever it takes to delete and cover up the old underwater pool light niche area (we dont need or want that anymore) . I think your first estimate is not out of the ballpark , maybe a tad high with only a 20mil liner installed, and not a lot of extra work required (like our light niche delete). Do you trust this company, and do they do GOOD work ? If so, a few hundred bucks is well worth it over a cheaper estimate from a company that might do less than a perfect job . 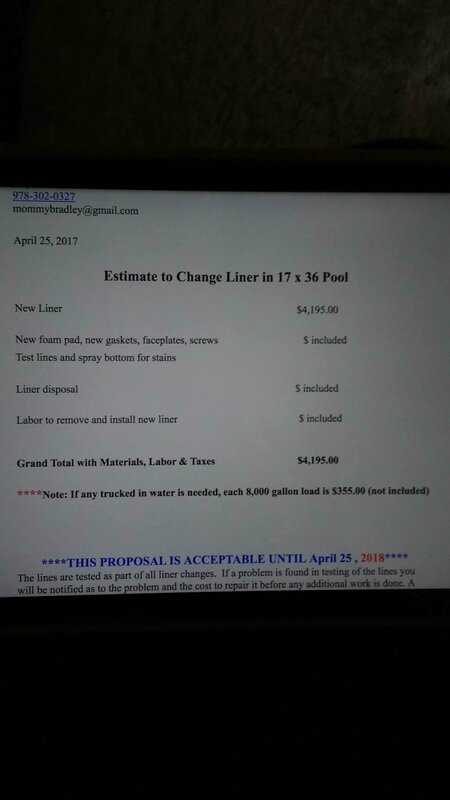 Thats why we are going with a slightly higher priced Pool co .
EDIT : Our choice of Pool Co. , after a more thorough quote and inspection of our pool, LOWERED their estimate of $3,500 to $3,300 !!! WooHoo !!! I have my local pool company out today to open the pool. They charge ~$365, but they take the cover off, put all the fittings back, vacuum the pool, skim, add chemicals, get everything up and running, and power wash the pool deck. They even drained the spa, power washed it, and then sucked all the dirt out with a shop vac before refilling it. Oh - and they added 25 lbs of salt for me. Landi Pools and Games in Vineland, NJ. Thanks for posting. I'm in eastern NC and have 2 quotes for a 20x40 Roman end. So far $5,000 and $4,300. Waiting on the last quote.